Why do I having problems with microwave exhaust duct? Because you haven't purchased my Kitchen Remodeling Edition book! Why do I need to add inline duct fan? Well, it may help you to increase airflow to a certain room. Why does my furnace bang when it shuts off? Because you are trying to save $4.00 and looking for free advice on the web verses the cheapest one on my website! Does an air leak in central air-conditioning make a whistling sound? Does HVAC duct need to be insulated in basement that is climate controlled? Why my return is ducts 32" wide? Because it is probably a very old one. 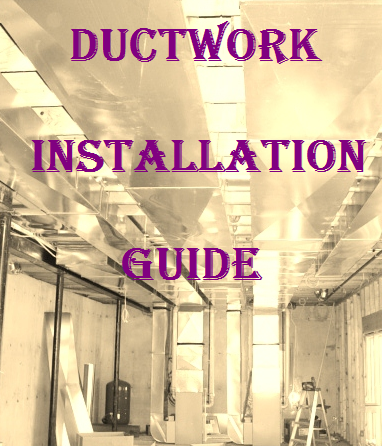 Mostly ductwork installers (tin knockers), but it can be you. On this page you can find a solution to your problem! Read the question, but do not skip the answers and feedbacks if it seems that your issue is a slightly different. The most of the solutions are the same and you just have to analyze information on the page and adapt it to your particular case. If there are still no a solution in sight, please go to the Parent Page and find the other more suitable to your case page. However, I would recommend you to read them all, it will definitely educate you to the point that you won't need any additional advice from any third party! All the secondary pages, just like this one, are free of charge and represent clear solutions to high/low humidity problems! The home is a ranch on a crawl. It's been hot and humid. The furnace is centrally located in house in a laundry room. The airflow is downward. In the laundry room is a 3/4 PVC drain that exits from the bottom of the unit near the floor. Under the furnace, into the crawlspace is the plenum, which comes about 16" from the floor (crawl space floor). From this plenum are two large cylinder shoots that feed various floor vents. The shoots exit the plenum towards the top. The drain in the furnace room is not clogged. I opened up the furnace panel to discover an A coil. It is clean. The drip pan is all PVC and I can only see about half of it, but that is clean too and doesn't have any standing water in it. I tried to take off the cover to see in the middle of the A coil and down into the plenum, but there is so little wiggle room to take off that panel, that I didn't try further. I poured water into the pan, as much as I could, to see if it all runs out the PVC drainpipe and it did. This also caused no water to drip into the plenum and onto the crawl floor. There is no sign of frost. The house cools fine. When the unit is on, there is a steady, immediate, trickle coming from the PVC pipe. And there is also a stead trickily coming from the bottom of the plenum in the crawl space about 5 minutes after the unit is on. Where is all this water coming from? Is it possible that the cold air into the plenum (into the crawl) is causing condensation inside the plenum thus all the water? NOTE: the outside of the plenum is cold, but doesn't sweat on the outside. The crawl has 2 or 3 vents where we have 1 vent open during the summer. The ductwork and plenum in the crawl space are not insulated. I second the call to a Pro; they should be able to determine the cause. We have called a pro. In fact, 3 companies have come out. They all claim nothing is wrong. However, not one of them has done any sort of troubleshooting like I have (I am an IT guy and know nothing about HVAC, but I do know how to troubleshoot to pin point an issue). Not once did any of them turn the unit on, go in the crawl and watch the water trickle from the plenum. At this point, I have lost hope in the pro's. The original installer won't call back. Each tech after that didn't go in the crawl. All they did open up the unit and indicate...drip pan is dry, nothing wrong here! You need a trap. Take a pic where the drain goes now, I don't see it in the crawl space pic. I think the water in the drain pan is fighting the air to get pushed out the hole...this is keeping the drain pan in the unit to full of water. 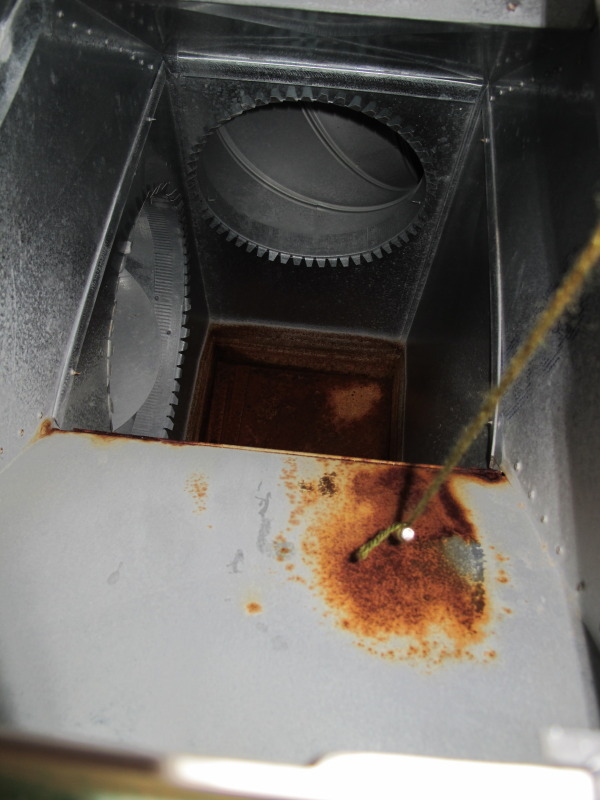 Water is splashing around the pan, dripping out, and falling in the plenum. Get some Plexiglas, put that on in place of the panel, get a flashlight and watch as its running. In addition, a heat source (water heater) has a PVC drainpipe blow air right up by the water heater burner area. 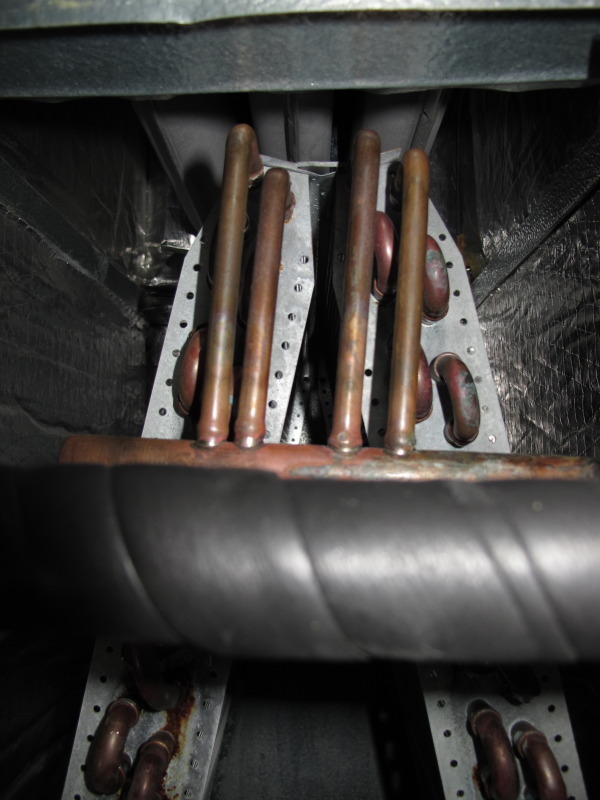 That is a down-flow gas furnace in the pictures, with the coil under the furnace. The coil is under positive pressure and so is the drain. Therefore, it is unlikely the lack of a trap is causing the drain pan to overflow. 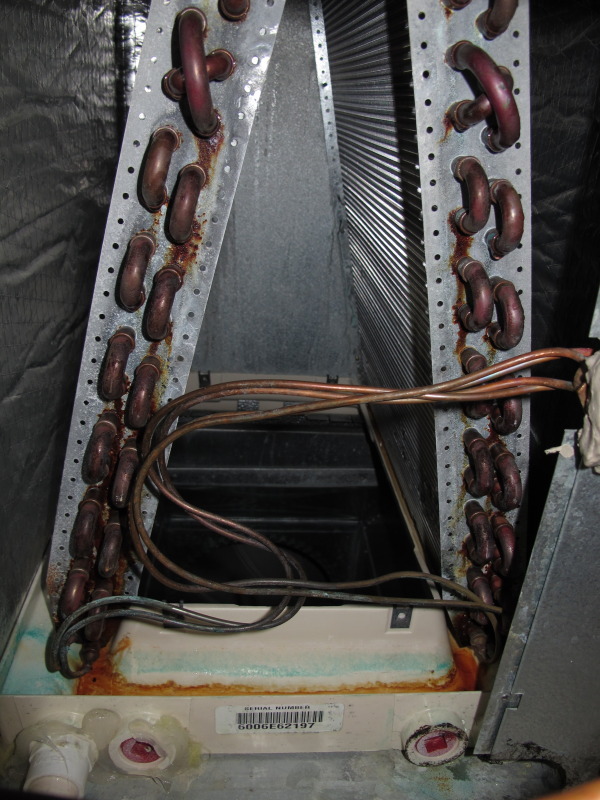 Is the evaporator coil Air Ease also? If so was or does it require alteration for down flow. There are two pieces of metal in the bottom right of the pictures or the coil that look like pieces we have to use on certain Trane coils to go down flow. 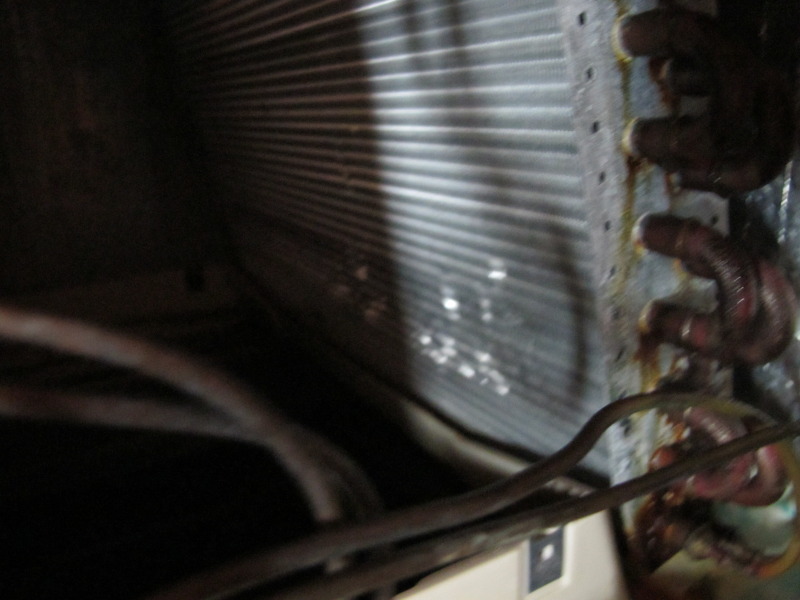 The Trane parts prevent condensate blow-off of the evaporator drain pan area. 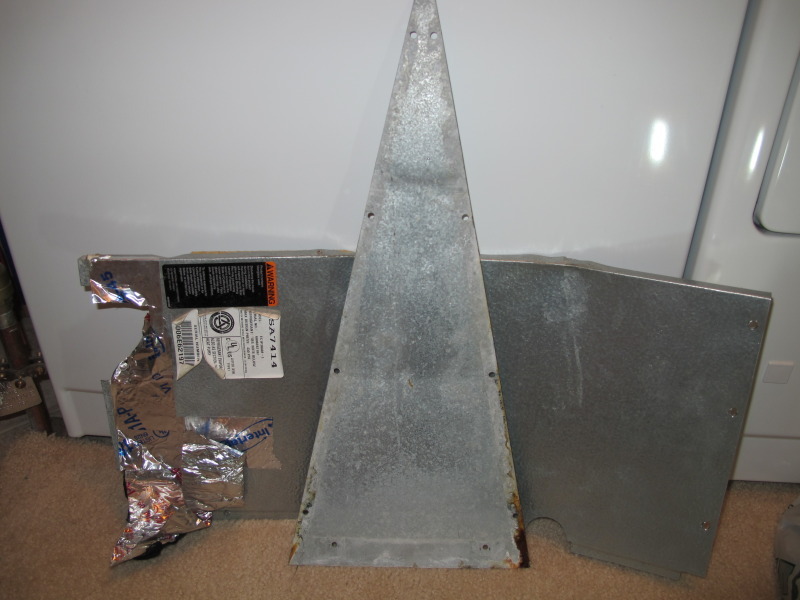 Note: The reason for the offset into the plenum is to go around an I-beam below. I am suspecting that none of the techs looked inside (with a mirror at least) to see this. This is where my waters is hitting and causing the plenum to leak down below. So, I plumbed a line upward to see if I can find the source of the drip. But I only found some indentations in the fins of the a coil. There are other areas of such indentations but even so, I don't know if this is the source of the water. So, with this new evidence, I will call out the owner of the HVAC co and discuss. From this new information, what else should I do to present to the owner? I am kind of disappointed as to why none of the other techs found this before me. It is sad, either I am a genius or they just didn't do their job (I kind of would like to think a little of both. Looks like water is blowing off the coil. Happens most with down-flow coils in humid climates. Carrier tells me that a restrictive return or air filter will aggravate this. What kind of filter are you using? 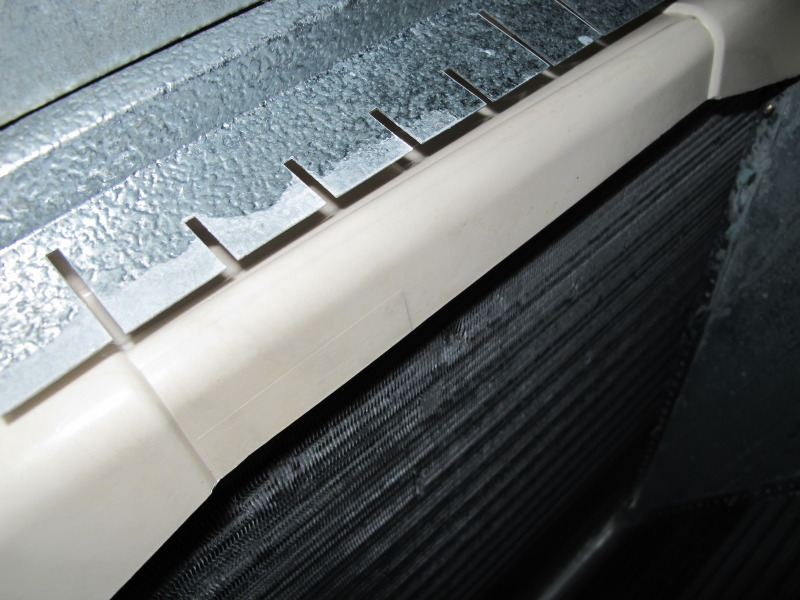 If it is a pleat or washable mesh, try replacing it with a fiberglass filter. High velocity at the coil, over about 500 FPM, can also cause it. You might be right in this situation, but I would think it would blow in various places inside the plenum and not specific as the pics show. However, given that the drain is at floor level, would lead to having to pipe through the floor and tap into a drain...this could be difficult as that would put me lower than the actual floor drain.